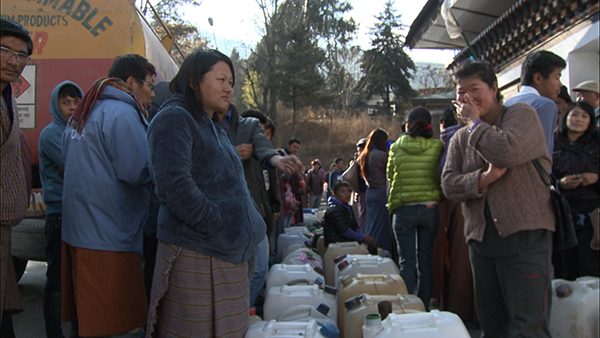 Shortage of kerosene at the capital for the last few days led to a huge rush at the Bhutan Oil Distributor’s retail outlet in Thimphu, today. Many people, with their empty Jerry cans, queued at the outlet uncertain of getting their share of fuel. It was quite a scene at the Bhutan Oil Distributor’s office in Thimphu with people and cars rushing to avail kerosene. The Manager at the depot was finding it increasingly difficult to manage the overwhelming crowd since morning. With the temperature dropping in Thimphu, kerosene demand has peaked. Kerosene consumption has increased from 6,400 liters in November to a whopping 114,000 liters, this month. The distributor’s manager, Karma Thinley said while he expected the daily consumption to be around 4,000 liters, it has peaked at 8,000 liters, today. Karma Thinley said the depot would continue to provide kerosene until the day’s quota is over. The depot may remain open till late night. It’s high time that Bhutanese depend more on electricity rather then fossil fuel.The addiction to fossil can be very costly. We can observe recent fule crisis in Nepal caused due to blockade in Nepal by India.Its high time to change our energy consumption pattern and use electricity which is at our disposal.